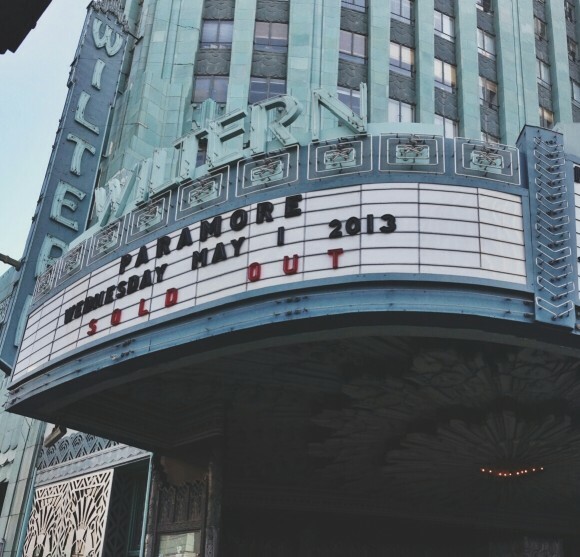 When presale tickets sell out before the “P” in Paramore is pronounced, you know you’re in for a good show. Though not intended as a “girl power” double billing, Paramore and KITTEN are most definitely bashing in the confines of female-lead stereotypes and kicking down doors in rock to astounding fanfare. They’re rocking it so much that the line for the show literally wrapped itself around the entire square block of the historic theater, almost looping right back to the front entrance. Roaring more like a lion than even the most feral of cats, the critically acclaimed L.A.-based KITTEN roared onto the stage, taking the entire audience by storm by showcasing their new EP Cut It Out. Though not nearly as close to 21 as they may like to be, the young band surprisingly defied their ages with music, melodies, lyrics and insight so much that even some of the most sage of performers fail to grasp. The energy of their ’80s inspired electro/new wave/punk show is unstoppable, as if the entire band were newly freed wild animals, pouring all of their pent-up angst from hours on the road into the stage. Chloe Chaidez, their front woman, literally slid onto the stage, shoeless, rocking booty shorts alit with printed flames and a see-through fishnet shirt in a very punk-chic style. Every inch of the stage was fair game as she whined to the floor like a dancehall queen, twisting, turning, kicking, jumping, spinning, laying on her back on stage, tugging, hitting and pulling on her bandmate’s hair, jackets, shirts…whatever she could catch on to. During their performance of “Sugar,” Chloe climbed to the top of the highest stack of speakers and lead the crowd in a furious cheer. Guitarist Waylon Rector and bassist Zach Bilson ran back and forth on stage, crashing into each other at times, still managing to realign themselves with their respective mics in time to sing harmonies. Bryan DeLeon’s unique and naturally angelic voice married right into his mastery of the synths and syncopated percussion he contributed to the music. Lukas Frank set the house ablaze while wildly splashing and thrashing the drum set. Performing their underground bubbler “G#”, their EP title track, “Cut It Out” and a pretty ballsy cover of Prince’s “Purple Rain” mid-set, the band definitely showed their sure but steady rise to the top of the charts. The road to success has been quite the bumpy one for Paramore, who have set records and topped the charts for four years, despite not dropping an album since Riot! in 2009. However, if you think bandmate arguments, roster changes, canceled tours and album postponing would affect their show, you’d be sorely mistaken. If fact, the mood was overwhelmingly celebratory for their new album release, the self-titled Paramore. A euphoric release could be felt both from the band and from the frenzied audience that sung along to every lyric of every song as the band’s blood, sweat and tears flooded through The Wiltern’s speakers. Singer Hayley Williams was not just alive, but she was on FIRE! Furthering the celebratory love fest, she mentioned that they had friends, family and even one of their producers in the house before inviting 8 members of the audience to come on stage and join the band for “Anklebiters.” Two microphones were placed on stage for them to sing into like a Paramore choir. Infusing modern technology into this scene, Williams’s iPhone camera was massively projected onto the backdrop so the entire audience could see her taking photos of them as they partied. After a painfully long encore break, Hayley and the band reemerged, playfully stating, “We tried to stay back there extra long just to tease you!” They continued, performing “Proof” and “Brick By Burning Brick” to the deafening sounds of fans cheering and jumping. To crown the evening, the show ended with an explosion of brightly colored streamers and confetti showering the audience. With great music and tight fan relationships, Paramore will continue to be unstoppable for years to come. Paramore’s latest album, Paramore and KITTEN’s EP Cut It Out are both available on iTunes.